Japanese filmmaker, Hayao Miyazaki, is credited with bringing anime to mainstream Western audiences. His 2001 movie, Spirited Away, won worldwide acclaim, including an Academy Award for Best Animated Feature, the first anime film to do so. Miyazaki’s works have influenced countless of animators and directors around the world. His animation studio, Studio Ghibli, began in 1985 following the success of Nausicaä of the Valley of the Wind. The anime feature films that it would go on to produce include several of the highest grossing films in Japan. Needless to say, Miyazaki and Studio Ghibli are a household name in Japan, and have now gained popularity worldwide. I have been a fan of Miyazaki’s films for as long as I remember. His films are always poignant and nostalgic, appealing to audiences both young and old. The stories are simple, yet sophisticated, with beautiful visuals full of imagination and wonder. 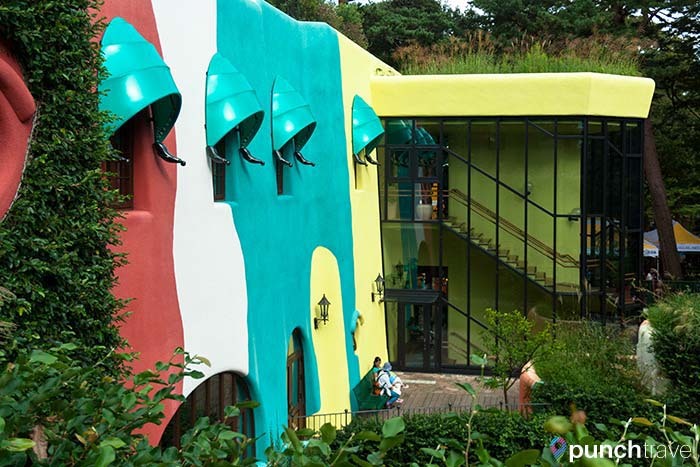 In 2001, the Ghibli Museum opened in Mitaka, about 20 minutes west of Tokyo. On my last trip to Tokyo I had tried and failed to get tickets to the museum. 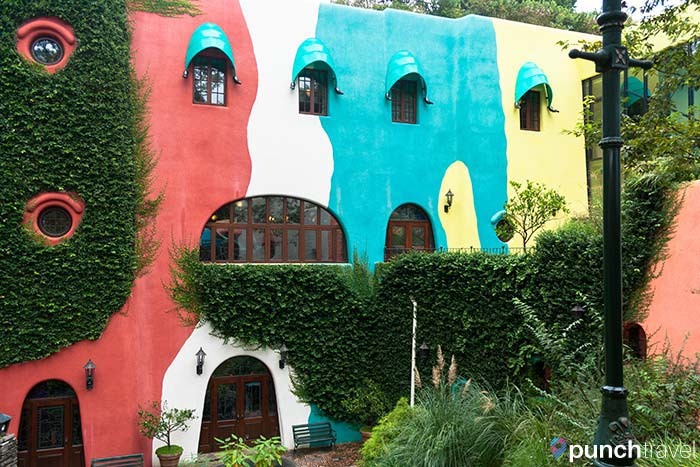 This time, I was not going to miss the opportunity to visit Ghibli Museum. One of the reasons why it is so difficult to visit is because it is not easy to get tickets. Tickets are timed, only sold in advance, and sell out fast. Tickets are ¥1,000 for adults, ¥700 for ages 13-18, ¥400 for ages 7-12, ¥100 for ages 4-6. Children under 4 are admitted free of charge. Tickets are only sold through JTB Group travel agency in each country. Click here for the list of countries and travel agencies (including link to purchase). Tickets go on sale from the tenth of each month for the following month (for example, tickets for July 1 through July 31 go on sale on June 10). Tickets may sell out quickly. Click here to purchase. Another option is to buy tickets while in Japan from a Lawson convenience store. The major risk here is that tickets might be sold out by the time you have arrived in Japan. Since we were staying over a month in Japan, we bought our tickets after we arrived. To my surprise, it was completely sold out for 4 weeks! We got them in the nick of time, just a few days before we were due to leave Japan. Tickets are sold from a Lotti machine within the Lawson store. 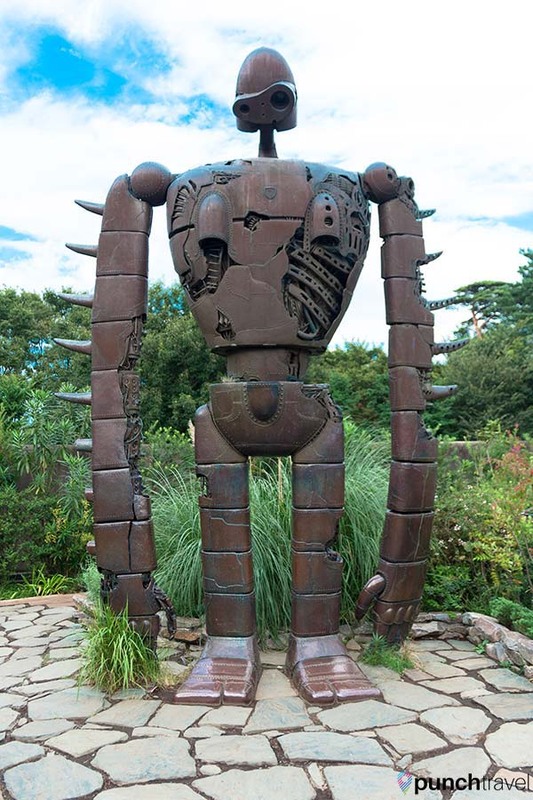 The machine is only in Japanese but the Ghibli Museum website has detailed step-by-step information on how to buy. Or, you can do as we did, and just ask a staff member at the store to help. Note that the tickets are printed with your name (in Japanese). You’ll need to bring an ID or passport with you when you visit the museum to confirm the name on the ticket. Waiting to buy your tickets until you are in Japan is a gamble. This option may only work if you plan to stay a long time in Japan. If you have a friend in Japan, or maybe even an Airbnb host, you could consider asking them to buy the tickets for you in advance. The museum is reached by taking the JR Chuo Sobu line west from Tokyo to Mitaka Station. 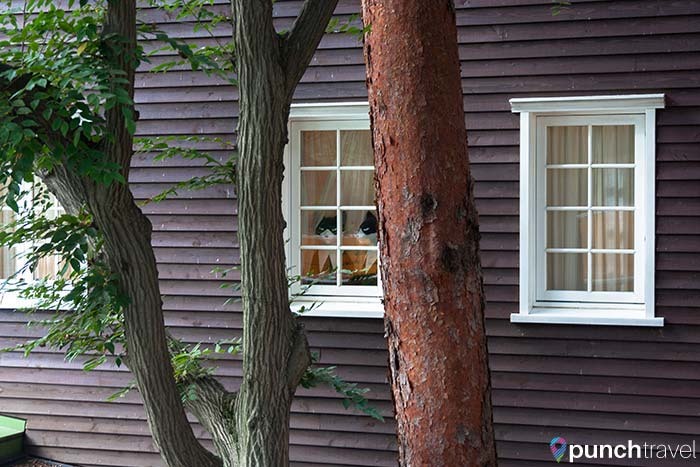 It is about 20 minutes from Shinjuku Station. Once arriving at the station you’ll see plenty of Ghibli characters in storefronts and signs, so you know you’re in the right place. There is a dedicated bus to the museum that leaves from the train station every 10 minutes. The ride costs 210 yen (one-way), 320 yen (round-trip) for adults and 110 yen (one-way), 160 yen (round-trip) for children under 12. However, the museum is only about 1km from the station and the path along Tamagawa Josui “Waterworks” is well-marked. 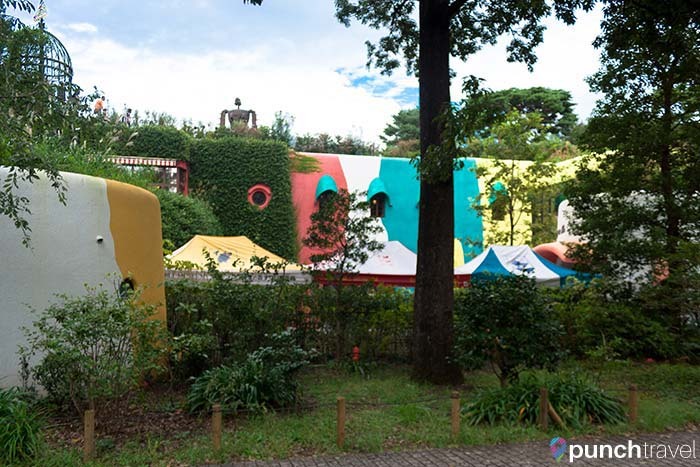 It took us less than 15 minutes to reach the museum at the corner of Mitaka Inokashira Park. We arrived at the entrance and were greeted by a giant Totoro figure from the film, My Neighbor Totoro. The real ticket entrance through, is around the corner. The first thing that I immediately noticed about the museum was the heavy Spanish influence. If you’ve visited Barcelona, you’ll agree. 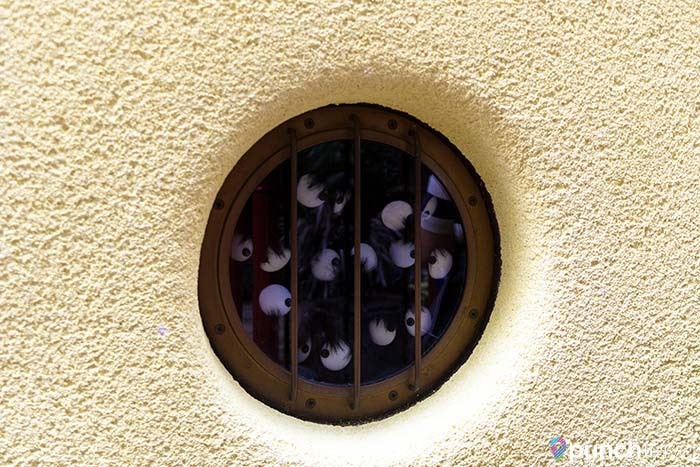 The building, the design and the accents all recalled Gaudi’s style. 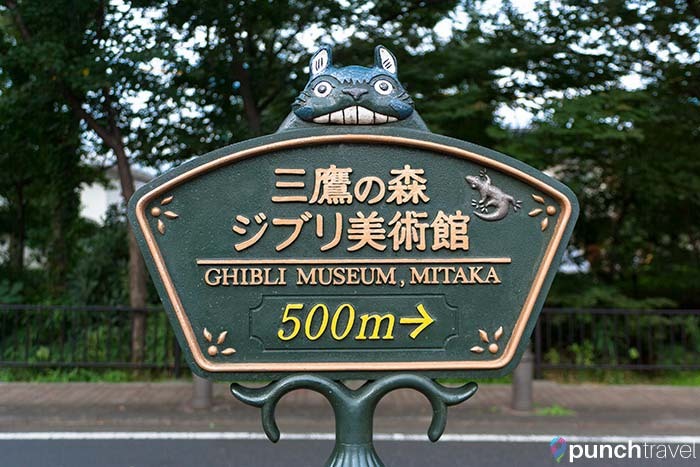 Even the museum itself is called Museo d’Arte Ghibli. 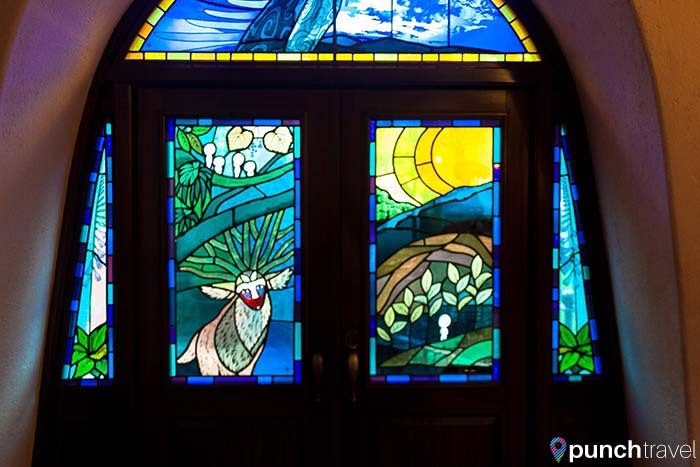 The admissions area is inside a domed room decorated with stained glass windows that portray scenes from the movies. In the center is a spectacular painted ceiling of a blue sky with a sun surrounded by trees filled with fruit and flowers. 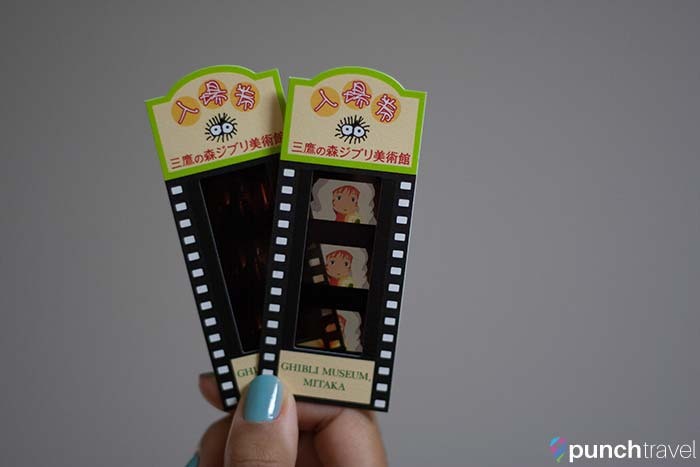 We exchanged our Lawson tickets for real tickets, which were little 35mm film strips from the movies. Hang on to these, as you’ll need it for the cinema. Stepping inside the museum was like stepping into a magical, whimsical world. Unfortunately, no photos are allowed inside the museum, so I’ll have to rely on my words to describe the interior. 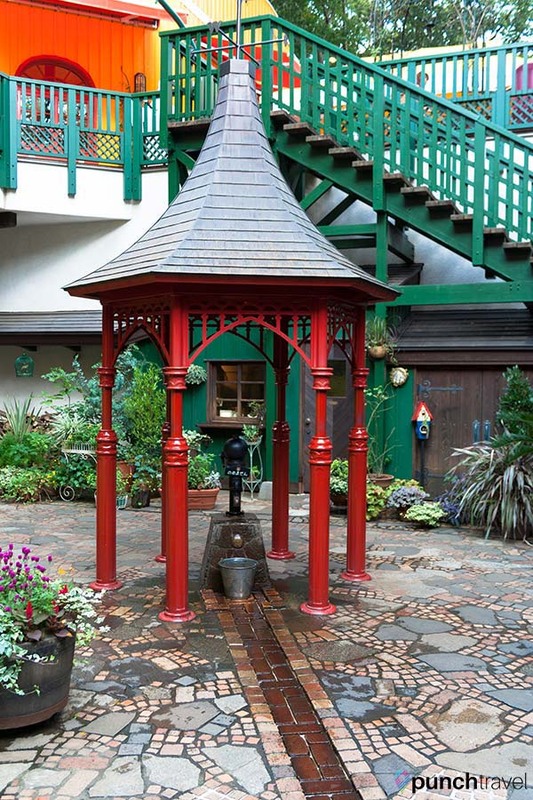 We entered into the atrium and everywhere we looked there was something to discover. From the atrium, we could look up to see all three floors of the museum. In the center, there is an elevator and a grand staircase leading to the top. 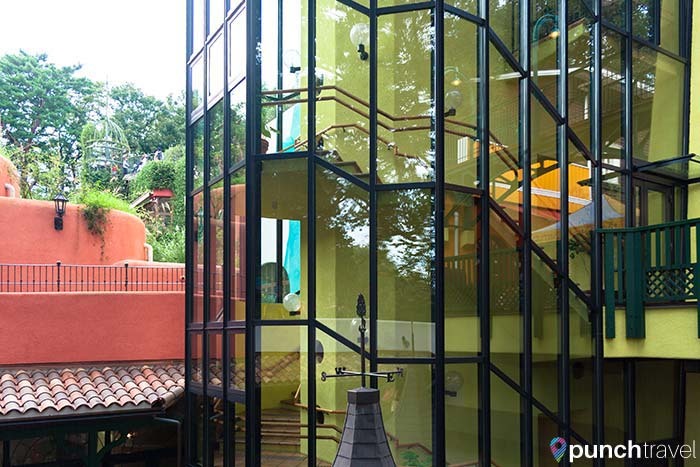 In another corner, is a narrow winding staircase that leads directly to the top floor. 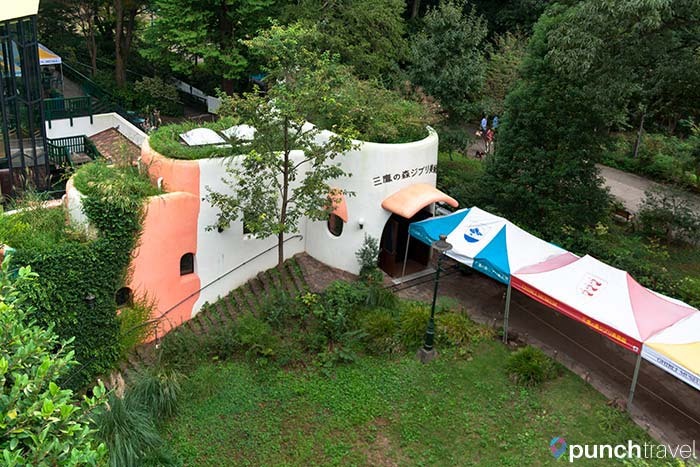 This space is designed to immediately transport the visitor into the world of Hayao Miyazaki and the strange buildings that often appear in his movies. The museum spans three floors. From this level, we first headed to the Saturn Theater. The Saturn Theater is a small theater with rows of plush red benches. Above, the ceiling is painted with a deep blue sky with a moon and stars in the center. The projectionist’s room at the back of theater looks like a train car, and you can look in to see how the film is projected. 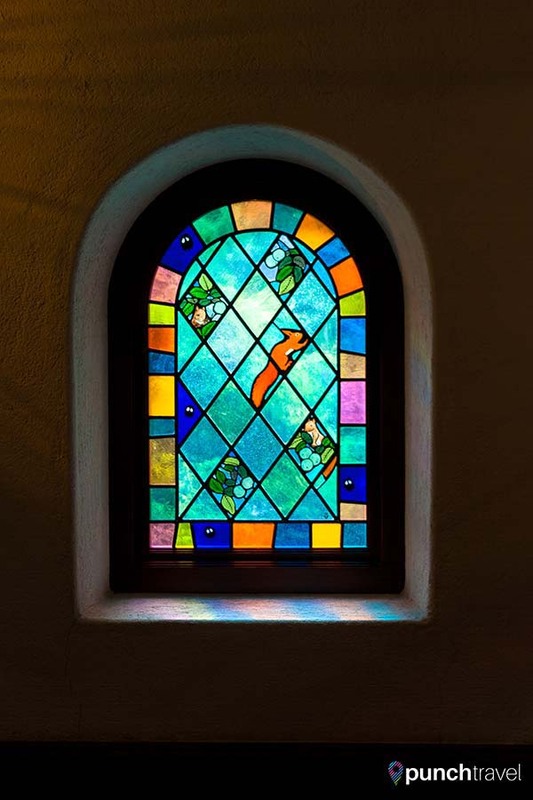 Beautiful stained glass windows decorate the building. Here, original short animated films which can only been seen at the museum are shown. We watched the movie, House Hunting, but the movie changes each month. Even though the movie was in Japanese, the limited dialogue and the visuals made it easy to understand for non-Japanese speakers as well as small children. Also on this floor is the permanent exhibit room, “The Beginning of Movement”. In this room, we learned about how “moving images” are created with persistence of vision, leveraging figurines from My Neighbor Totoro and strobe lights. Also in this room are scenes and dioramas from many of the films. From here we continued to the second floor which contains two exhibit rooms. The permanent exhibit, “Where a Film is Born”, shows the process in which animated films are born, from the initial inspiration through to completion. Through the course of five rooms, we followed the process of animated filmmaking. All of the displays are in Japanese so I had to rely on my imagination to figure out what was being presented. I presumed that the first room was a recreation of Miyazaki’s studios. Plastered on every inch of the walls are sketches and inspiration boards. Art and photography books line the bookshelves. Items that have found their way into the films, like model airplanes, dried flowers, and photograph albums of the countryside, Bavarian villages, and suburban streets are placed around the room. As we moved along, we saw how a sketch is printed into a film, and how colors are applied. The process seemed very long and painstakingly detailed. The other exhibit space houses the temporary exhibition room, currently “All Aboard! The Cat Bus to the Ghibli Forest”. Exactly as it sounds, we entered into a life size cat bus. If you haven’t seen My Neighbor Totoro, the cat bus is a bus shaped like a cat that transports the two sisters across the treetops and telephone lines. It was just like I imagined it: soft fur everywhere and comfy benches inside. Even the nose of the bus felt like a real cat’s nose. There were other models from the films, including the airplane from Porco Rosso. In this room you can also project your 35mm ticket to see what scene you have. The top floor contains another cat bus, but for kids only. It looked like a lot of fun. There were even a pile of Dust Bunnies to play with. There is also a reading room which contains children’s books recommended by Miyazaki. Here you can buy art prints from the movies. The museum gift shop is also located on the top floor, and I spent an inordinate amount of time analyzing what to purchase. 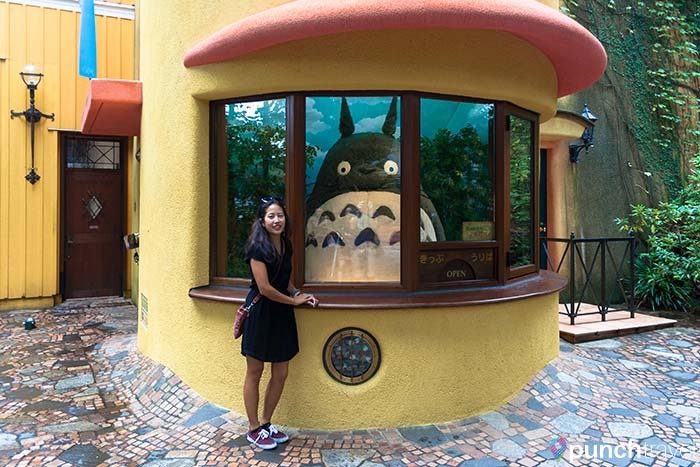 The shop is filled with everything a Ghibli fan could want. From postcards and puzzles to jewelry and finely-crafted figurines, there are items at all price points. 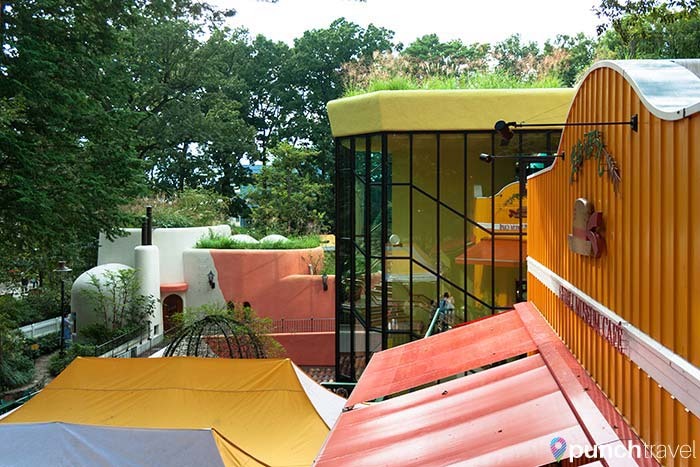 From the terrace off the Cat Bus Room, a spiral stairway leads to the small rooftop garden. We were immediately greeted with the towering Robot Soldier from Castle in the Sky. 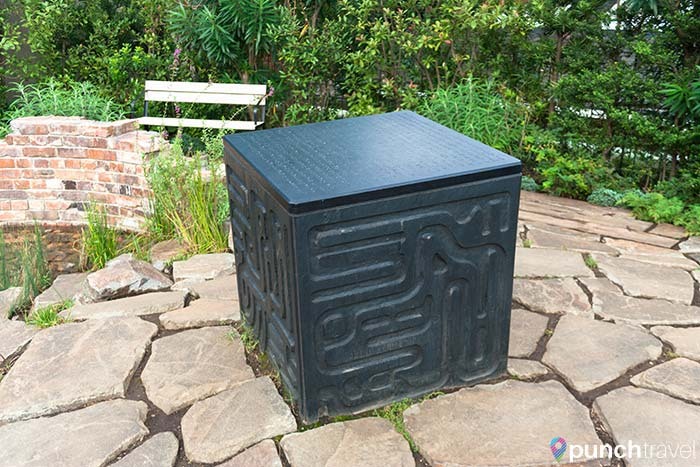 On the other side is a small garden with the Command Cube from the same movie. If you look closely you’ll also find some acorns left by Totoro. 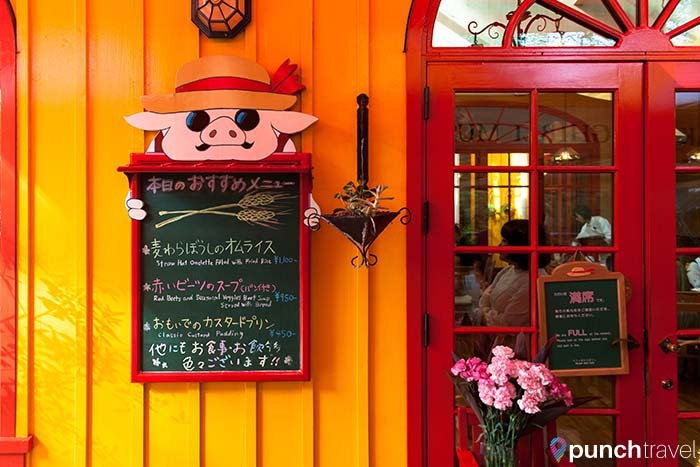 The museum has one restaurant, the Straw Hat Cafe. 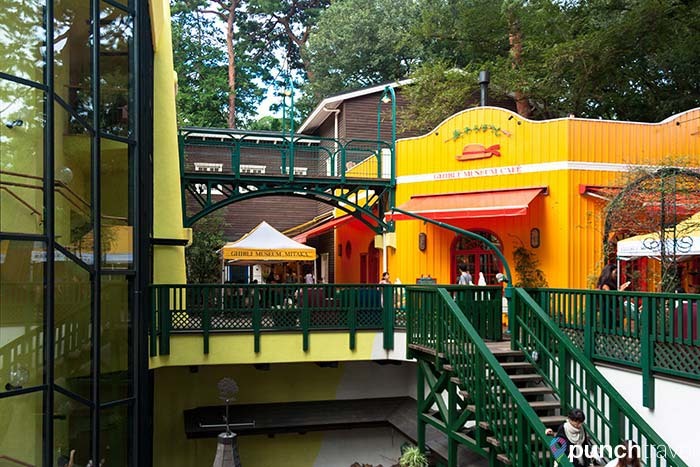 When we visited, the cafe had a line so we didn’t bother eating there. There is also a take out counter where you can purchase hot dogs, french fries, ice cream and other light fare. They even sell their own organic beer, called “Valley of the Wind” beer, which features a label hand drawn by Hayao Miyazaki’s son, Goro, who is an animation director at Studio Ghibli. Bringing your own food from outside is also permitted. This is the motto of the museum, and it really has achieved just that. After visiting each of the rooms, we continued to explore the maze-like building, discovering new things. 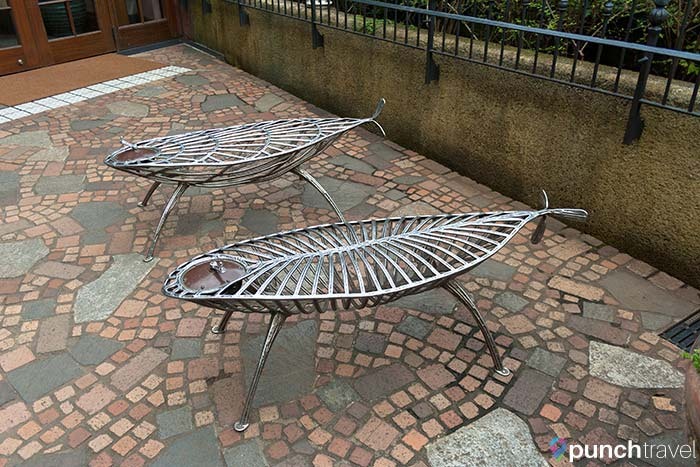 A chair is not just a chair, it is a seat in which you can view a short animation. Dust bunnies hide in corners and scenes from the films are recreated in the artwork on the walls and the stained-glass windows. A recurring character in the films, the Dust Bunnies are spirits that live in dark, uninhabited spaces. We spent about 3 hours in the museum, including taking a break to eat lunch and spending too much time in the gift shop. You could easily spend less than 2 hours here if you just visit the exhibit rooms. 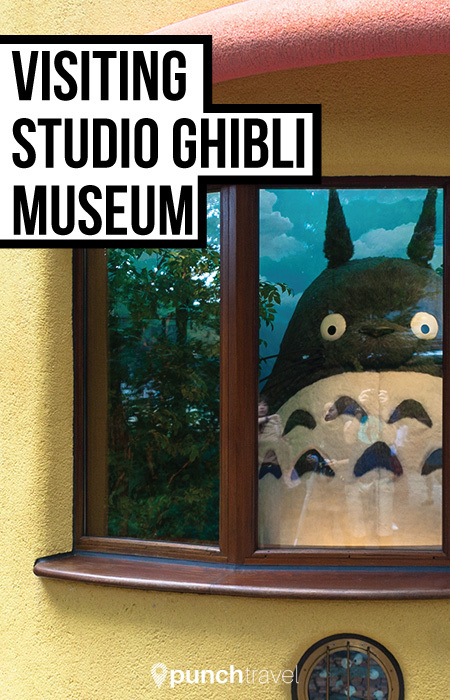 You don’t need to be familiar with MIyazaki’s films to enjoy the museum. All you need is a sense of wonder and imagination to be transported into the world of Hayao Miyazaki and Studio Ghibli.